The computer-based TOEFL (CBT) was introduced in 1998. Its format is very similar to that of the original paper-based test. In areas where the computer-based test is not available, the paper-based test is used. Remember that you cannot change your answers in the first two sections of the CBT after you have confirmed them on the computer. There are more "types" of questions in the CBT, such as clicking on a phrase and looking at a diagram. Before you start the CBT you will take a tutorial which shows you how to answer the questions properly. 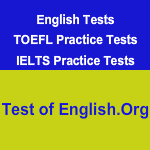 The total time you will spend taking the paper-based test is 2.5 hours. The CBT takes approximately 4 hours (including tutorials).